General coloration is iridescent silvery-gray overall, with a coppery cast that is usually darker on the back and upper sides. One (or more) black ocellar spots on the upper sides near the base of the tail. Historic distribution of red drum on the Atlantic coast is from the Gulf of Main to northern Mexico. This species has become uncommon north of New Jersey. Maximum adult size is nearly 5 feet (1.5 meters) total length. 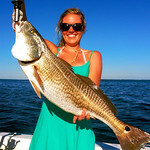 The largest recorded red drum was 59 inches and 98 pounds. Adult red drum occur in Chesapeake Bay from May through November and are most abundant near the bay mouth in salinities above 15 parts per thousand. Males first spawn between ages two and three (21 inches in length), while females mature at ages three to five (36 inches in length). Spawning occurs at night in the summer and fall in nearshore waters. Large females can produce up to several million eggs in a single season. The recreational season for catching red drum is open year round. Currently, recreationally caught red drum must be at least 18 inches but no more than 27 inches to keep, and anglers are permitted 1 fish/person/day. Commercially caught red drum must be 18 to 25 inches, with a 5 fish per day limit. Red drum derive their name from the croaking or drumming sound they produce by resonating their large swim bladder. The oldest recorded red drum was 62 years old.